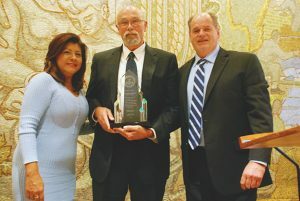 NFFE National President Bill Dougan, center, receives a commemorative plaque from IAM General Secretary-Treasurer Dora Cervantes, left, and General Vice President Rickey Wallace, right, at Dougan’s retirement reception. William “Bill” Dougan, National President of the National Federation of Federal Employees (NFFE-IAM), is retiring after nearly four decades of service to the federal workforce. His last day on the job was December 15, 2016. Dougan, a former U.S. Forest Service worker and NFFE president for the past nine years, has played a key role in advocating for federal workers amid constant political attacks. Under Dougan’s leadership, NFFE revitalized its organizing and communications strategies, which have markedly increased the union’s membership. Dougan has expanded the union’s voice to new individuals and forums nationwide. Dougan founded and was elected chairman of the Federal Workers Alliance, a collective effort of 22 unions representing more than 300,000 federal employees. As a member of the National Counicl on Federal Labor-Management Relations, Dougan worked with top administration and agency officials to build strong labor-management forums. Dougan also served on a number of other federal and non-profit groups, such as the Employee Thrift Advisory Council, the Federal Employee Education and Assistance Fund, and the Federal Advisory Council on Occupational Safety and Health. Randy Erwin, a 15-year NFFE-IAM member, was elected to be the next NFFE National President at the union’s 50th National Convention in September. The post IAM Salutes Retiring NFFE National President Bill Dougan appeared first on IAMAW.